Poppy has big dreams-lots of them! But following her dreams isn't as easy as it sounds. Poppy wants to be a ballerina, a singer, and a supermodel but people just keep telling her no! It's a good thing Poppy's friends and family-who love her no matter what-encourage her to keep believing in herself and pursuing her dreams. Poppy achieves her dreams and will inspire readers to believe that they can too! Kristi Yamaguchi has always been one of my favorite figure skaters. Not only is she talented at her sport, but she is gracious and humble and just an all-around nice person. The projection of positive energy that she radiates has manifested into this adorable children's book about the importance of perseverance and finding your dreams. At the risk of writing spoilers, this is not the story of a little pig who practices really hard and wins a gold medal in the Olympics (which is I'm sure what everyone assumes before they pick this book up and read it - I know I did). Instead, it's the story of setting goals and watching them come to fruition in other ways than just winning. It sends the message to kids to do what you love no matter if you win or not, regardless of what others tell you. This might be a tough message to buy from such a lavishly decorated Olympic athlete, but you get the sense from this book that she would have skated and continued to skate for many years, Olympic champion or not. Her positive attitude and dedication to hard work is what makes people love and admire her, gold medal or not. Michelle Kwan proved that you don't have to be an Olympic champion for people to love you. You just have to work hard, be passionate, gracious, and humble. Kristi is all of those things and more. Keep writing books Kristi! Kids need more role models like you in this world. There are far too many Kim Khardashians, Lindsay Lohans, Snooki Polizzis, and Paris Hiltons out there. Kids need people worth emulating and there are far too many shameful people walking red carpets today disguised as role models. 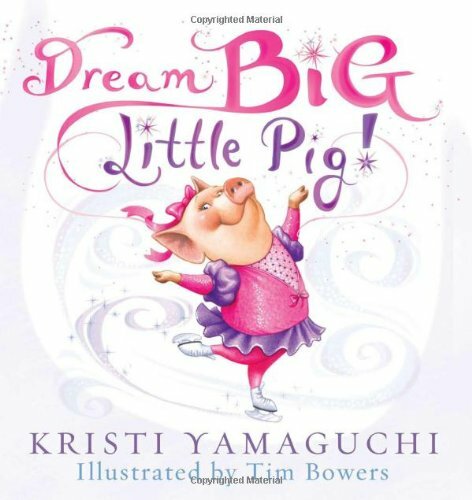 I love pigs and I love Kristi Y, sounds like a book I'd buy for my kid! She was at my kids school last week reading this book. It was a great story. Hooray for Krisit for writing this book. It sounds like a good one for kids. Have a great day!